The Heads of State and Government and High Representatives met at the United Nations Headquarters in New York from 17-25 September 2015 at the UN General Assembly and decided on 17 new global Sustainable Development Goals. All member states, including the Iranian regime were required to start implementing the Agenda in 2016. In the months leading to the Iranian regime’s presidential elections, however, the Agenda 2030 and its Education 2030 document turned into a focal point of controversy and an issue of wrangling among the regime’s internal factions. Tehran officials expressed their opposition to the agenda, one after the other, with the mullahs’ supreme leader, Ali Khamenei, weighing in. This study aims to examine the reasons for the Iranian regime officials’ hysteric reaction to the agenda and its education document. Finally, the tensions over Education 2030 document were resolved with the decision of the Supreme Council for Cultural Revolution to stop implementing it. The SCCR meeting was held on June 13, 2017 and presided by Hassan Rouhani. The fourth goal of the 17 Sustainable Development Goals (SDGs) of Agenda 2030 is about education. 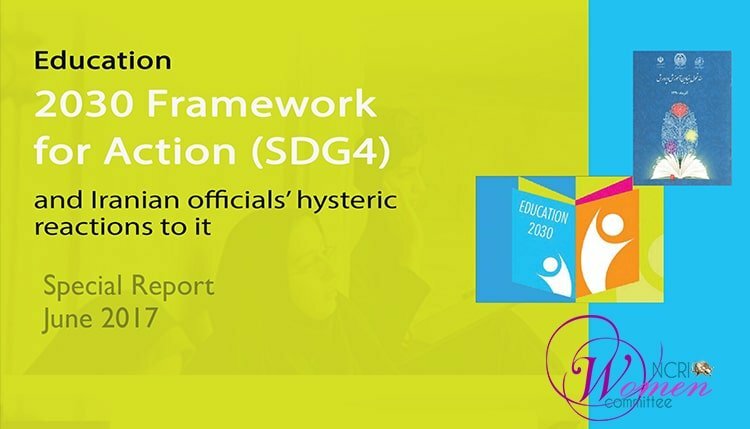 The document called, Education 2030, Incheon Declaration and Framework for Action, was adopted in the World Education Forum 2015, in Incheon, South Korea. Incheon Declaration for Education 2030 set out a new vision for education for the next fifteen years. The declaration was later adopted by ministers of education from more than 90 countries in the 38th General Conference of UNESCO from 4-6 November 2015 at the headquarters of UNESCO in Paris. Education is at the heart of the 2030 Agenda for Sustainable Development and essential for the success of all SDGs. Recognizing the important role of education, the 2030 Agenda for Sustainable Development highlights education as a stand-alone goal (SDG 4) and also includes targets on education under several other SDGs, notably those on health; growth and employment; sustainable consumption and production; and climate change. In fact, education can accelerate progress towards the achievement of all of the SDGs and therefore should be part of the strategies to achieve each of them. The renewed education agenda encapsulated in Goal 4 is comprehensive, holistic, ambitious, aspirational and universal, and inspired by a vision of education that transforms the lives of individuals, communities and societies, leaving no one behind. In target 5, we see that it seeks to “eliminate gender disparities in education” by 2030. Target 7 emphasizes acquiring the knowledge and skills through education needed by all to ensure sustainable lifestyles, human rights, gender equality, promotion of a culture of peace and non-violence, global citizenship and appreciation of cultural diversity and of culture’s contribution to sustainable development. Explaining the history of the Iranian regime’s catastrophic conduct in any of the above said fields does not fit into this study. Those interested can refer to the website of the NCRI Women’s Committee (www.women.ncr-iran.org) and examine the documents section to find information. However, a general review of the Fundamental Reform Document of Education (FRDE) which replaced the Education 2030 Framework for Action reveals the ambitions of the Iranian regime. Not only they do not seek to eliminate inequalities, create a culture of tolerance or promote peace and non-violence, but they seek to preserve and enhance the fundamentalist views of the ruling regime under the banner of Islam. They seek to further enhance gender, religious and ethnic discriminations. In contrast to the 2030 Agenda SDG4 and its targets that seek to facilitate everyone’s access to the necessary knowledge and skills to promote sustainable development and eliminate gender discrimination, the FDRE promotes the grounds for such discriminations, particularly against women. Under the pretext of “modesty”, the regime seeks to enforce the veil, gender segregation and regulations against women when it frequently repeats this term in the articles. In the same chapter in strategy 14.2, FDRE stresses gender segregation in academic areas. In Chapter 2, article 25, under the pretext of spreading Islam, the regime declares its ambition to interfere in the affairs of the neighboring countries. As it was noted earlier, the Iranian regime’s officials view the Education 2030 document as a “disgraceful” document “bearing a colonialist content” which manifests “one of the most bitter examples of infiltration” and promotes “educational transformation”, “elimination of sexual stereotypes”, “gender equality”, and “global citizenship”, causing grave “security” concerns. The reason why this “non-binding” document with the genuine goal of equitable education and learning opportunities for all sends such tremors through the ruling clique in Iran, goes back to the regime’s own objectives as well as its instability and lack of minimum social popularity. After all, this is a regime that deprives girls from studying in some 80 fields of education in universities. Every month, dozens of Bahaii’s are expelled from universities for adhering to their faith. Many girls are forced to quit school due to the laws allowing parents to forcibly wed their daughters as young as 9 and 10. Many cannot attend school because of poverty and lack of government support for children’s education before the age of maturity. Based on figures published by the National Statistics Center of Iran, some 9,483,028 people are considered illiterate, 6,025,965 of whom are women. This means that two-thirds of illiterates in Iran are women. This includes 3,200,000 children who are deprived of education. Illiteracy among women and girls is a cause of concern and considered a crisis in 40 Iranian cities. In the southeastern province of Sistan-o Baluchistan, there are 169,000 children, including 156,000 girls, who are deprived of education. In the city of Abarkooh, in the central province of Yazd, 97% of women between 10 to 49 years of age are illiterate. In the 2016-2017 academic year, there were 799 high school girls were identified as being deprived of education in Charmahal-e Bakhtiari Province, 218 of them due to early marriage. According to the General Director of Education in Kohgiluyeh and Boyer-Ahmad Province, most of the students who quit school in this province are girls and they do so due to economic problems. In the southern province of Hormuzgan, 14000 students are deprived of education. In West Azerbaijan Province, 1500 elementary students are deprived of education, a six-fold rise compared to last year. A total of 14,088 students are deprived of education in the southwestern Khuzistan Province, 78 percent of whom are girls, most of them between 7 and 14 years of age. Most of the students living in poor districts marry in early age and do not continue their education. Sixty per cent of the 500 students who have quit school over the past three years in the city of Dezful, have been girls. In some districts in Ahwaz, the capital of Khuzistan, only one out of every four girls get high school diplomas. Another expert said the number of girls deprived of education is twice the number of boys. She said girls usually become deprived of education due to economic problems, shortage of educational spaces, social problems, and living in places where it is difficult to have access to schools. In October 2015, the General Director of Tehran’s Department of Education said there were 25,000 school-age children in the capital who worked to earn a living. The above facts make it crystal clear that gender equality and equal opportunities for women target the heart of the fundamentalist regime ruling Iran and indeed, this is the essence and root cause of the regime’s animosity and antagonism to Education 2003 Framework for Action and the Agenda 2030 as a whole. Ten-point Plan of Maryam Rajavi, President-elect of the National Council of Resistance of Iran.